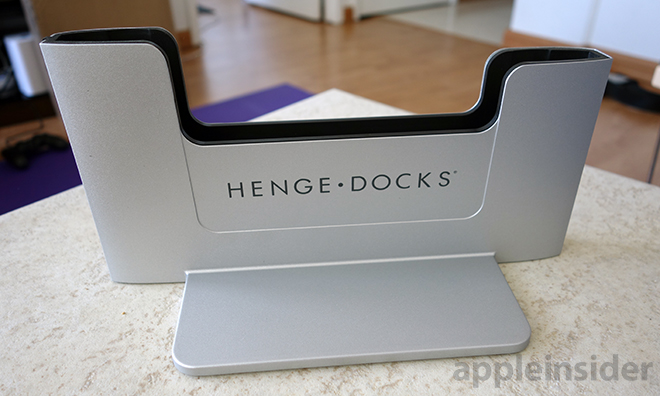 After using the new Retina MacBook Pro dock for a few weeks, we can safely say Henge Docks' latest product is the company's best effort so far. The new Vertical Docking Station is a rethinking of the firm's well-known vertical stand. A new metal alloy construction far surpasses the hard plastic composite used in previous designs, details like covered screws for cable installation and superior material choice make for one of the best laptop docking solutions we've ever seen. 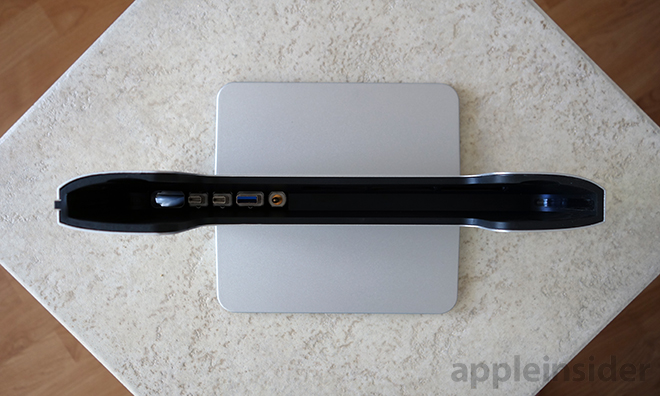 For this review, we used Apple's late-2013 15-inch MacBook Pro with Retina display and a metal edition Vertical Docking Station furnished by Henge Docks. 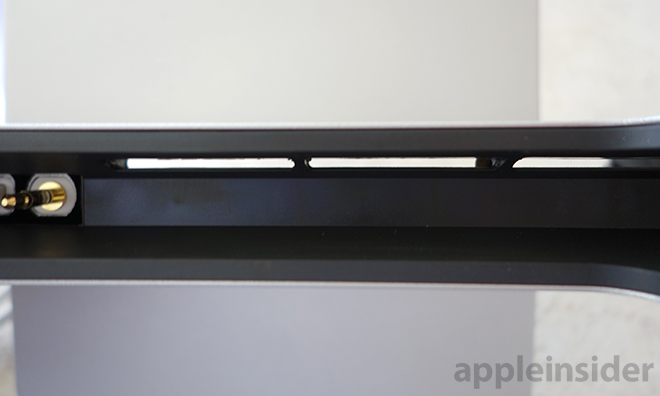 Based on current composite Henge Docks designs, the Retina MacBook Pro Vertical Dock is extremely well made. Weighing in at 2.5 pounds, the dock is crafted from a high-density metal alloy that not only keeps the MacBook from tipping over, but matches the aluminum laptop's aesthetic. The dock itself is basically a metal superstructure with a formed plastic cradle and strategically placed soft rubber inserts. Wherever the MacBook makes contact with the dock, a thick rubber material is there to ensure a snug fit and inhibit unnecessary movement. 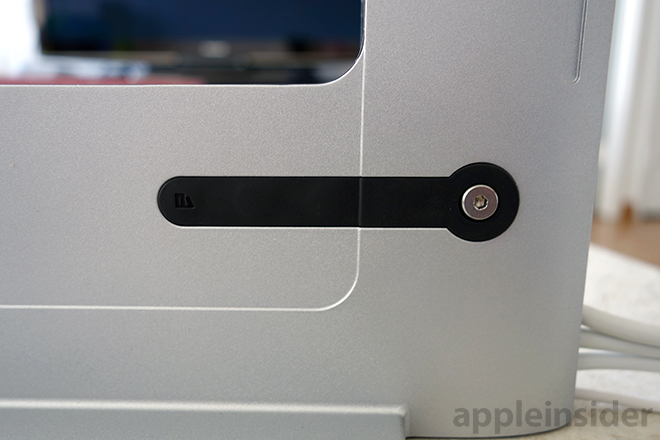 As with other Henge Docks products, the Retina MacBook version is form-fitted down to cutouts for the laptop's feet. Special to this model are holes in the cradle that line up with the MacBook's side intake vents, as well as a rear slot for escaping hot air, allowing for optimal air flow even while under heavy load. As seen in the photos above, the Vertical Docking Station carries over Henge Docks' typical styling cues, with two raised tongues gripping the MacBook on all sides to stop it from toppling over. A large base measuring 6 5/8 inches long by 6 3/8 inches wide keeps everything grounded, while tacky rubber strips run the perimeter to prevent from slippage. With the Retina MacBook Pro's compact port layout, Henge Docks was able to consolidate cable inlets into a very small area. 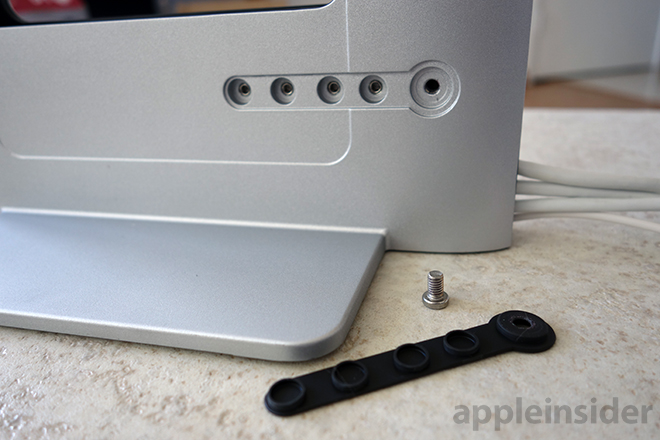 Covering the screws is a 3-inch long strip of rubber with an anchor that doubles as a screw-down for Apple's MagSafe 2 power adapter. The design not only hides unsightly screws, but protects them from damage and debris. Finally, a hex tool is integrated into the base of the docking station for easy access when removing or installing cables. 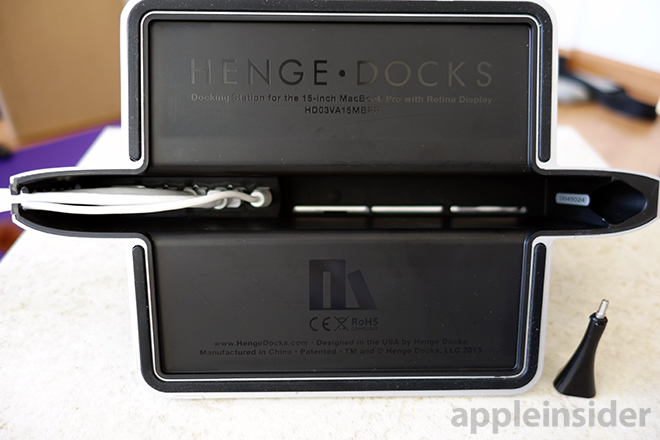 The latest Henge Docks are basically ready to go right out of the box. The appropriate plugs are installed in the correct slots —two Thunderbolt, one USB 3.0, TRRS audio and room a slot for a MagSafe 2 cord —meaning all you have to do is position the dock near a display or HDTV, run extensions cables and slip in a MacBook. Inserting a MacBook is simple as the inner rubber sheathing serves as a guide to align the dock's plugs with the Pro's left-hand ports. As mentioned above, we found the dock to be quite sturdy, especially given the new design's metal build. There was, however, a bit of wiggle room between the dock and laptop. We were able to rock the MacBook back and forth ever so slightly, though displacement was on the order of millimeters; definitely not enough to disrupt overall stability. 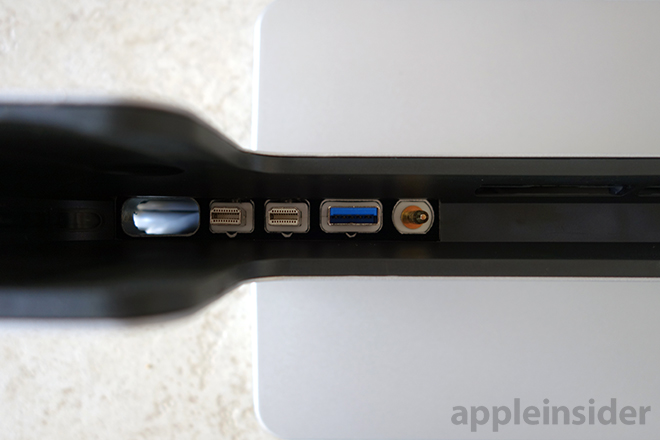 One of Henge Docks' strengths has always been cable management and the new made-for-Retina dock continues that heritage with cable-appropriate plastic adapter tabs for MagSafe cords and a new built-in routing system. Instead of having system cables spill out through a cutout in the back of the dock, the metal version employs a rubber organizer that keeps cords in their place. Henge Docks includes two DisplayPort cables installed where the MacBook Pro's Thunderbolt ports are located, meaning users have to supply their own cables to gain full Thunderbolt capabilities. This was fine for our purposes as the dock was being used to connect to a non-Thunderbolt display. We did end up using the hex tool to swap out one of the DisplayPort cables to connect to a Thunderbolt server. Because the HDMI output is located on the laptop's right side, enlisting the Henge dock for media serving duties is simple. We ended up placing the unit right next to our HDTV's input panel to have quick access to a short HDMI cable left dangling from the television. To use the MacBook Pro while in clamshell mode, that is with the screen closed, the laptop needs to be connected to a power outlet. 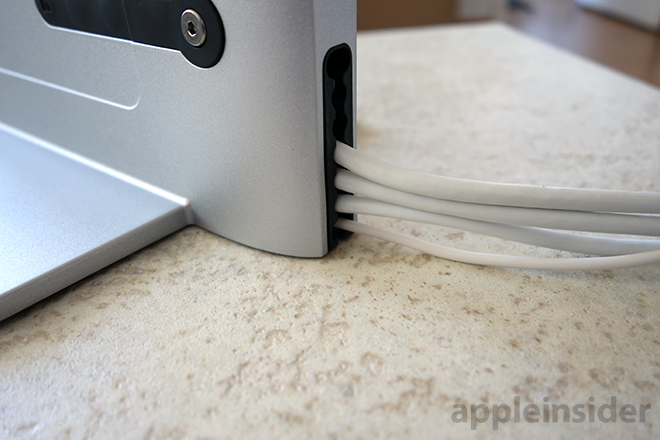 Running a MagSafe cable through the dock each time you use it can become tiresome, but unless you own two power cords, there really is no other option. Perhaps in future versions Henge Docks could design a break-free clamp, but for now users are stuck with the screw-in anchor. We found the power cord's magnets were strong enough to hold the cable in place during use, but users who regularly dock their laptop may want to screw it in. This is especially true given the relative ease with which MagSafe 2 disengages. Like past Henge Docks designs, dismounting the laptop is requires two hands. This shouldn't be surprising given the dock's snug fit, though we expected the added weight would help the situation. Not so. 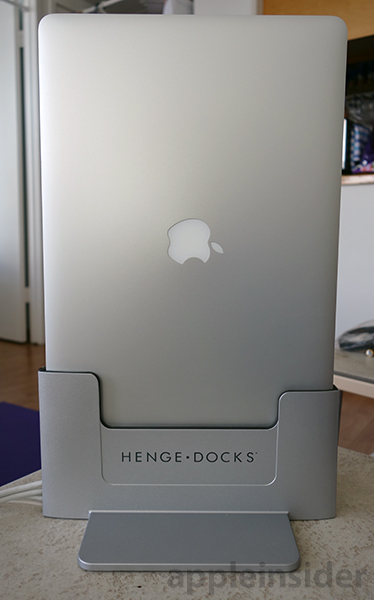 Henge Docks is flexing its design muscle with the Retina MacBook Pro Vertical Docking Station. The new metal body is more sturdy than previous models, while the seemingly minor additions of a screw cover and cable organizer simply add to perceived build quality. With slick improvements to an already solid design, Henge Docks' Vertical Docking Station is an easy recommendation for Retina MacBook Pro owners who regularly use an external display or connect their machine to an HDTV. The new Henge Docks Vertical Docking Station for Apple's MacBook Pro with Retina display is available now from the company's website. The 13-inch and 15-inch metal edition is priced at $119, while a composite Glossy White version can be had for $89.